I am surrounded by books, notes, journal articles, pens, pencils and cups of tea. As I’m reading over and over the same paragraph I’m thinking that I need to find a way to cook more, to evolve my cooking. Although Anthropology of Food is the most interesting thing I’ve ever studied, I feel like I have neglected my true passion: touching, smelling, tasting, cooking food. And I do not mean just prepare dinner. 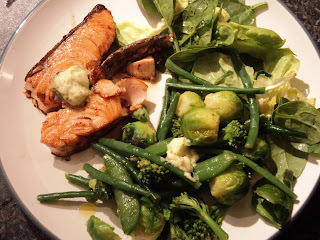 That is now quite easy as there is not much time for anything other than simple, quick, tasty weeknight dishes like salmon with lime butter broccoli, sugar snap peas and brussels sprouts. I need something challenging; something that will motivate me. I need The Weekly Cooking Experiment! At a seminar I attended recently they said that if you publicly make a commitment then it is harder for you to neglect it. Therefore, with fear of embarrassing myself to you dear reader, I have decided to do exactly that: I commit to cook something new, exciting and complicated, every weekend, take notes and photographs and share it with you! Game on! We're looking forward to your amazing recipes in the coming weeks . . .
We your audience are looking forward too it! Cannot wait for you to 'wow' us. That's a brilliant idea! You go get 'em, lady. We will await with bated breath... Damn, I might even have a go myself! We're watching, and waiting! Εύγε!